On June 15, I made a bold prediction about Linksys. I predicted, "I'm going to go out on a limb and make a prediction that Linksys will sell a turnkey, "plug and play" SOHO IP-PBX in 2006 ". I received some nasty emails telling me I was crazy to suggest that Linksys would launch a product that would be competitive to their parent company, namely Cisco who sells CallManager. 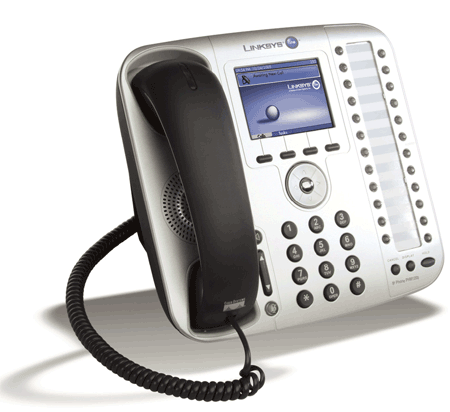 Well, today, Linksys launched Linksys One, their IP-PBX communications system for the SMB. I should point out that a few months ago Linksys read some of my blog predictions and told me I was "dead on" and that they were indeed working on a IP-PBX solution, but they couldn't elaborate. It wasn't until last week that they gave me the full story on a new product they were developing. I interviewed Marthin De Beer, Linksys VP/GM of the Linksys Small Business Systems Business Unit about Linksys One, which will be launched later today. "Linksys is entering the small business communications arena with a hosted small business solution. This solution facilitates the automation of deployment, installation and software updates from a service provider with the affordable, easy to use, Linksys One products that will live on the customer premise and will be installed and supported and sold by VARs," said Marthin. Marthin explained the unique business model as well as the unique synergies between the VAR and the service provider: "Linksys One is a new product brand for us, which will be specifically used for these hosted small business systems. This solution facilitates a new go to market strength for us in that it brings a complementary way for small businesses, VARs, and service providers to work together in this value chain." He continued, "In the past, the VAR is the trusted adviser of the SMB. They are the ones you call when you want a PBX. On the other hand they would sell this standalone customer premise devices where as service providers would try and sell hosted services and so they would often compete. With Linksys One they will actually work together in this model where someone like MCI would host the services for Linksys One, the VAR would go sell, install, deploy and, and support that customer, and the customer gets a full plug-n-play communications system that suits all their needs." Marthin also mentioned that they are also announcing a new VAR program to support Linksys One. I asked the target market for Linksys One and he said, "We're talking about employees of 100 employees or less. There are about 35 million of those businesses around the world sand they spend about $12 billion/year on routing, switching, storage, telecom gear, and wireless. So it's a very big market. Our market share between Linksys and Cisco is small - less than 10% - though it is a significant new opportunity for us to go after." Here's a target market breakdown of how the new Linksys One fits in with Linksys and Cisco. Marthin expounded on how the Linksys One platform addresses a market need. "The biggest problem we are solving is when you think about being a small business owner you're stuck having to buy from a Chinese menu, technologies that you need for your business and you're often stuck trying to make them work yourself or you have to pay someone to configure the firewall, the switch, the PBX, key system, and so it's really really tough on the small business owner. On top of that he has to deal with multiple providers of service whether it's voice, or Internet access, or conferencing, and so forth, and so he has to deal with these different places where he acquired service from. Lastly, one of the biggest challenges is if something breaks, or there is a flood and he has to relocate his business, his business could be severely compromised since it could take months to get back up and running. Today, small businesses do not have a good disaster recovery solution in place today. Linksys One addresses these issues." "Linksys One is a very easy to deploy, affordable, yet complete communications solution for small business, "explained Marthin. "It is purpose built -we built this product from the ground up. 18 months ago we looked inside of Cisco, we looked inside of Linksys, we looked outside, and there was no one that has a complete solution like what we're talking about with Linksys One." When asked what some of the key elements of Linksys One were, he replied, "the key is that this system operates and functions as a single system. If you have the services router which includes a router, switch, firewall, all in one box, but it also includes voice routing and switching, includes security, wireless, and even network attached storage, So that's what I say it is a complete system - it's really everything a small business owner would need. 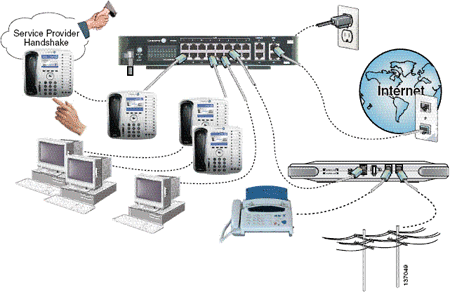 He can attach his PCs, his IP phones, his wireless IP phones, video cameras, NAS, fax machines. Everything connects to the system and everything communicates across a single broadband access network based on the services the company is paying for from the service provider." Marthin also mentioned it supported IEEE's Power over Ethernet (PoE) spec as well as the SIP protocol. 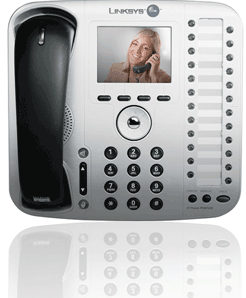 It uses SIP trunking for dialtone connecting to a SIP-enabled service provider which then provides termination. When inquired to explain how this fit into the service provider network, Marthin explained, "This has very tight integration with the service provider and in fact, what an ‘MCI' would provide in this context would be bundled service that includes internet access, unlimited local and long distance, and could even include the equipment, so that the small business owner doesn't have to get a loan. Rather, they just start paying for the equipment on a per seat per month basis. On average, the SMB pays about $62/employee/month for telecommunications costs, just the services part. But what you will see from the solution's part is that they'll roughly be paying the same to get the equipment and the services they need." With Linksys One, we are completely hiding the complexity of IP technology to the SMB owner. The deployment becomes very simple. The VAR will enter the customer's information by browsing up into the service node and then when the equipment arrives on site, the VAR will unpack the box, connect the IP phones to the services router, etc. and power up the product. The VAR only has to enter three numbers that he had ahead of time and which identifies the customer. The system on-site then completely auto-configures. So what you end up with is an inline-powered LAN switch, with multiple VLANs to every phone, QoS enabled router, a high-performance, stateful packet inspection firewall, a fully configured key system, where the VAR could have even setup speed dials ahead of time for individual users. And if anything breaks you can just remove the device, and plug in a new device and since the configurations all get stored up on the service node, the device auto-configures. I asked, "Is there a TFTP server in the box? Is that how you are configuring the devices?" and Marthin said, "Ah , this is where my team has spent most of their time over the last 18 months. Because, as you can imagine having these devices come up, advertise their services, auto-discover and then auto-configure based on the configuration that was entered at the service provider network is a lot of the 'secret sauce' we've developed. We're actually using SOAP and XML for these auto-configurations. It really is facilitated by the service node at the service provider network. So if you add a camera, it auto configures. You can then also sign up to a security surveillance service from the service provider. That camera can detect motion and record the video. The service provider can then VPN into the services router and see what is going on. The service provider can then alert the small business owner. This is totally a new way for the SMB to deploy a complete system like this but also to get access to services." Next I asked, "What about third-party SIP phones?" and Marthin said, "If you want the auto configure, plug and play capabilities then you have to buy a Linksys One phone, however, because Linksys One is standards-based solution, any SIP phone will work, but you will have to go manually configure and you won't get all the features necessarily." When I asked what other unique aspects the Linksys One platform has, Marthin said, "If you think of IP-PBX's today there's always some sort of server in the equation. The core processing runs somewhere. In this architecture we don't have any core processing on any server. In fact, it's a pure peer-to-peer SIP model. The core processing runs all the way out on the edge - it runs on every phone, so there is no call server in this architecture. This is very interesting so for one you don't have to manage this call manager server and secondly you save a significant amount of cost on this architecture." He also pointed out that the voicemail runs on each phone. Marthin continued, "Also, Linksys One keeps calls as voice over IP between businesses when they're running on the same service provider and you get new capabilities you didn't get before leveraging web services.For instance, Business A calls Business B and the call connects. But at the same time if you hit an IVR, instead of listening to an IVR, the system that you called will push the IVR options to the display of the calling party's phone. So you can see the options on the screen and they simply press a number on the phone." Wow, browsing another company's IVR on your phone display - very cool. B) Linksys also mentioned that they support the G.722 wideband codecs for excellent sound quality. "Now you mentioned that it's P2P SIP, but what about remote survivability? If the WAN link goes down will you still be able to make extension-to-extension calls?" I asked. "There is a small SIP proxy server in the service router. So you can call between phones if the broadband lionk goes down. We also have a small box, the VGA2000 Analog Gateway, that can be used for PSTN failover or for connecting analog devices such as fax machines." After Marthin pointed out that you can use a USB attached hard drive for email or even run a small web server on the service router I asked him, "Does the service router have a hard disk or flash memory?" He replied, "It has half a gigabyte of flash, but externally though the USB interface you can connect a USB hard drive or can even do a network attached storage option." "The next questions I have are what sort of operating system will this "future" Linksys IP-PBX run on and will it run on solid state memory/firmware (more bulletproof) or will it contain a hard disk drive (more flexible)? 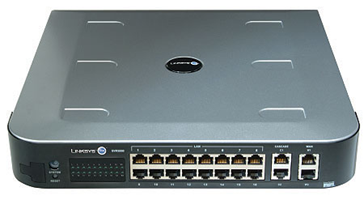 Currently, Linksys solutions use firmware for their networking products and a web interface for management. I hope that it does have a hard drive since that allows for more flexibility and much greater voicemail storage, but it certainly adds more cost. The other advantage of including a hard drive is to give developers and "tinkerers" the ability to install customized software applications"
- meeting BOTH of my system requirements for a flexible communications system. I'm 2 for 2 on my predictions, though I thought that the Linux IP-PBX would be either flash memory OR a hard disk - I didn't even consider it could be both. "it makes me wonder if Linksys will depart from Cisco's operating system choice and go with Linux since that will reduce the overall pricetag and add more flexibility for third-party applications. 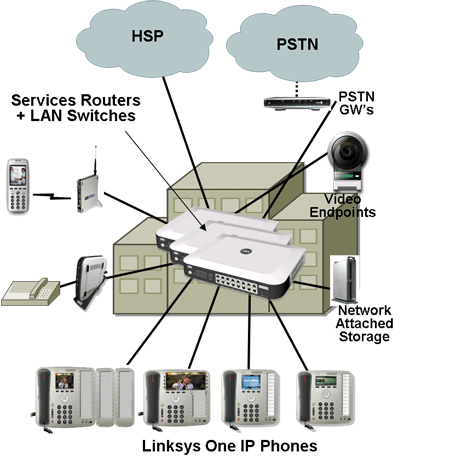 My guess is that this hypothetical Linksys IP-PBX will be some sort of Linux variant." "LinkSys will announce this as early as December of this year. My prediction is early 2006 that Linksys will launch this product. Now that I have made this prediction watch competitors D-Link or SMC Networks scramble to beat Linksys to the punch. 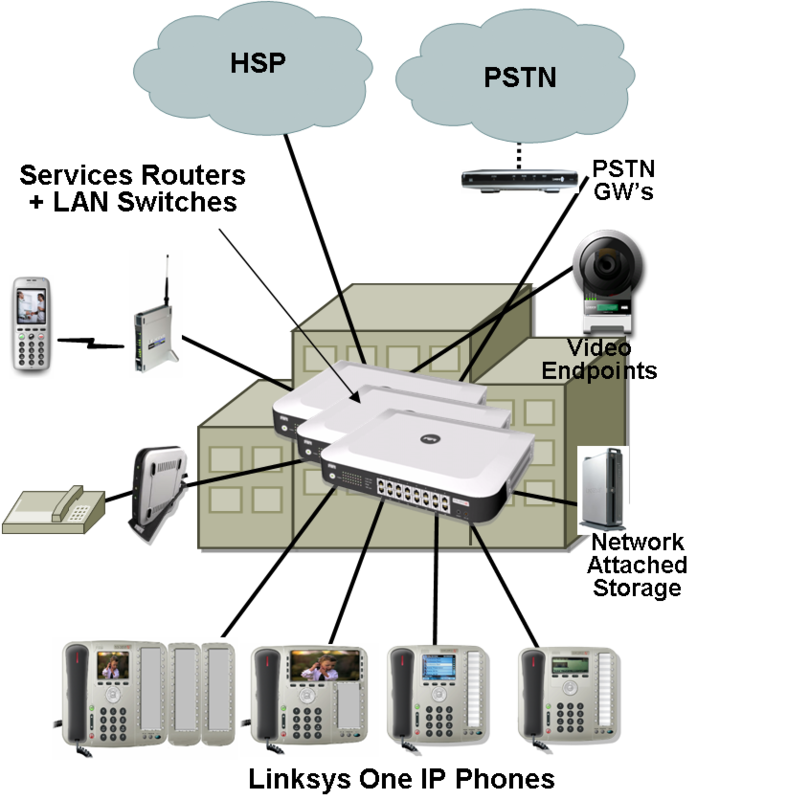 If this happens, and my blog gave D-Link or SMC Networks the idea for a SOHO IP-PBX, you can send me my $5000 flat-rate consulting fee or 1% of all future SOHO IP-PBX revenue." Well, I was off by one month - Linksys launched in November not December, but I was pretty damn close. Also, unfortunately, D-Link and SMC Networks didn't take my prediction or my advice to heart. So I'm out my $5,000 consulting fee and they're now playing catchup to Linksys One. ;) All in all, I was quite impressed with the Linksys One solution and look forward to playing around with it in TMC Labs. We already have MCI as our Internet service provider, so it might be possible for me to test Linksys One in TMC Labs even though they are in limited trials. US - Gen Avail, APAC - Limited Avail, EMEA - Limited Avail - mid-May 2006. I asked the target market for Linksys One and he said, "We're talking about employees of 100 employees or less. There are about 35 million of those businesses around the world sand they spend about \$12 billion/year on routing, switching, storage, telecom gear, and wireless. So it's a very big market. Our market share between Linksys and Cisco is small - less than 10% - though it is a significant new opportunity for us to go after." When inquired to explain how this fit into the service provider network, Marthin explained, "This has very tight integration with the service provider and in fact, what an ‘MCI' would provide in this context would be bundled service that includes internet access, unlimited local and long distance, and could even include the equipment, so that the small business owner doesn't have to get a loan. Rather, they just start paying for the equipment on a per seat per month basis. On average, the SMB pays about \$62/employee/month for telecommunications costs, just the services part. But what you will see from the solution's part is that they'll roughly be paying the same to get the equipment and the services they need." "LinkSys will announce this as early as December of this year. 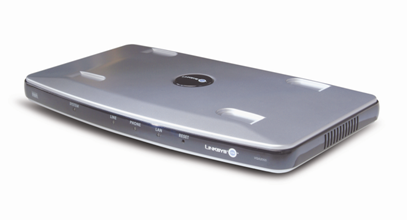 My prediction is early 2006 that Linksys will launch this product. Now that I have made this prediction watch competitors D-Link or SMC Networks scramble to beat Linksys to the punch. If this happens, and my blog gave D-Link or SMC Networks the idea for a SOHO IP-PBX, you can send me my \$5000 flat-rate consulting fee or 1% of all future SOHO IP-PBX revenue." Well, I was off by one month - Linksys launched in November not December, but I was pretty damn close. Also, unfortunately, D-Link and SMC Networks didn't take my prediction or my advice to heart. So I'm out my \$5,000 consulting fee and they're now playing catchup to Linksys One. ;) All in all, I was quite impressed with the Linksys One solution and look forward to playing around with it in TMC Labs. We already have MCI as our Internet service provider, so it might be possible for me to test Linksys One in TMC Labs even though they are in limited trials.